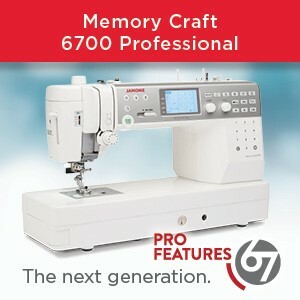 ← Best Kept Secret on Your Sewing Machine (and Serger)! I really liked Linda’s post a few days ago when she shared A Best Kept secret for sewing & serging: using the presser foot pressure dial. I think there is sometimes a tendency to miss these “obvious” things when we have been sewing for so long. eg my stitches look terrible, my machine sounds clunky and I forget that really I should put in a new needle! Little thing but pretty important. So Linda’s post inspired me to add a few things I tend to just do without thinking! I have had a big chunk of slinky in a lovely vibrant lime green/yellow colour for quite some time (purchased from Gala Fabrics at the BC SEWING SHOWS….there’s a good reason right off the bat to attend these shows & score on fabric bargains like I did!) I decided it was high time to make it up into something. I chose a top with a drape neck that I have made many times and a simple maxi skirt which still seems to be pretty “hot” fashion wise. I am not a slave to fashion but I do pay some attention to trends. Now I realize it is a “hit you in the eye” colour so I doubt I am going to wear both garments at the same time (as in the pic above). I will more than likely team up the top with navy or black pants or skirts. 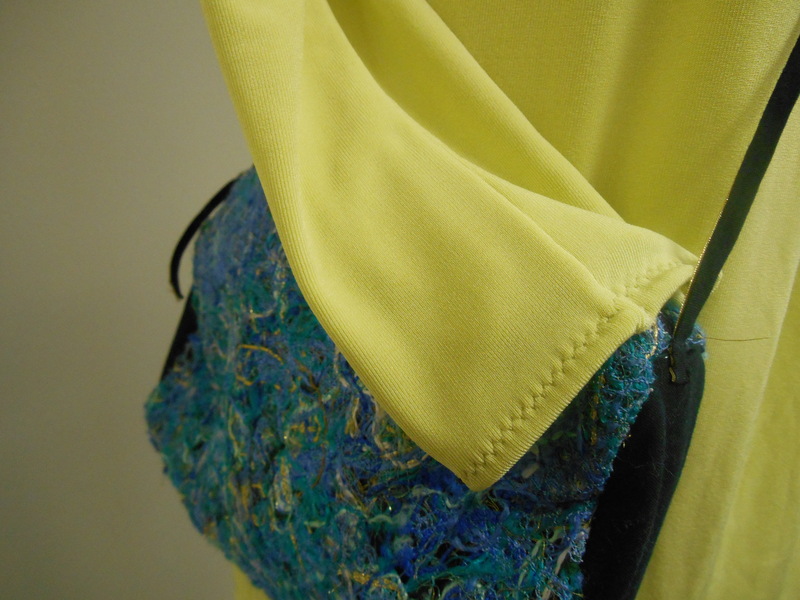 The skirt can be teamed up with various tops & jackets (loose flowing ones to suit the slinky fabric). These will probably either match or contrast the yellow/green colour. I guess I will need to buy or make a scarf that will look good with the top and pick up some of the colour from the skirt. And yes, I know people will see me coming but what the heck……maybe I will “brighten” someone’s day! Slinky is a lovely fabric to wear: it is soft, drapes extraordinarily well and looks good. I remember Linda MacPhee telling people at her Sewing Show Fashion shows that slinky is a fabric for all body types. It looks wonderful on a slender person but also covers over and drapes well on more generous body shapes. I agree with her. It is also exceptionally comfortable to wear. It also does not crease or wrinkle so is a perfect item to pack in a suitcase…….which of course I do rather a lot! However, if you have not sewed with slinky before, you may be in for a little surprise. It slithers & slides all over and is SUPER stretchy. So cutting out can be a problem. I discovered long ago that pinning my pattern to slinky was not clever. The fabric stretches & the pins tore my pattern. Tip #1 The fabric cannot under any circumstances hang off the cutting table! It all has to pool or be folded so it does not pull on the part you are cutting. This is pretty standard for all knit fabrics – of course. Tip #2 : I have found that I much prefer to use weights for cutting out: I have a bunch of smooth stones/small rocks I use but you can purchase special fabric weights for this purpose. large flat metal washers at the hardware store also do the trick nicely. I position these on top of my pattern and cut out before marking my fabric & then removing my pattern. Tip #3 – my recommendation is to ONLY use a serger to sew the seams on slinky fabric. 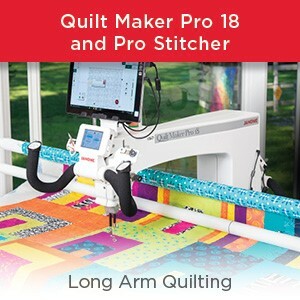 Yes, you can adjust a regular sewing machine to sew a stretch stitch or a narrow zig-zag but at the end of the day, it is just so much easier and more successful to use the stretch stitch (or 4 thread overedge seam) on your serger. I simply would not bother to sew slinky without a serger – too much fuss and risk of seams popping as it stretches so much. Note the serged seams inside. 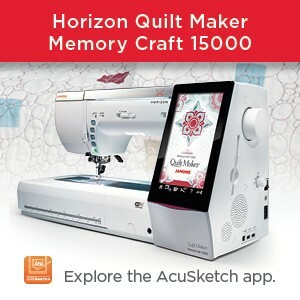 This makes it super fast to sew up….no fuss, no hassle. Just quickly and neatly accomplished. Tip #4 is the fact that slinky pretty much “grows”. By this I mean that if you hang up a completed garment, the stretch in the fabric literally lengthens it as it hangs – due to the weight of the fabric! So the idea is to let it hang for a while until you do the hem(s). Or don’t hem it at all, which is OK as the fabric does not unravel at all. Then the hemline can be trimmed later on if the hemline is too long. Note my zig – zag hems on the sleeves. I matched the thread as close as I had in my collection of sewing threads. I did not hem the skirt in the pic. I figured it was well left as it was. 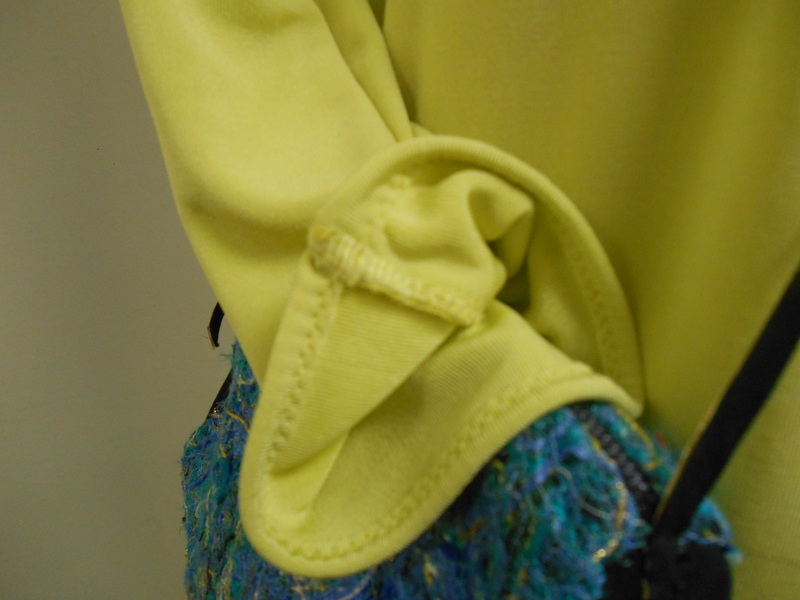 I did however, hem the sleeves & top hem with a narrow zig – zag stitch. Usually I use my JANOME COVERPRO serger to do a coverhem on knit fabrics but this time thought I would do something a little different. The jury is still out on whether that was a wise move as I have a suspicion that the zig-zag stitching is going to “pop” when I put on & take off this top. Washing machines also get clothing into a bit of a tangle & pull on seams too. First few times will probably be OK but long term……not so sure. So I might end up doing a coverhem after all. And tip #5: try adjusting the presser foot pressure as Linda shared in the blog immediately before this one. Have you sewed with slinky? What did you find out? We’d love to hear your hints & tips in our comment box. 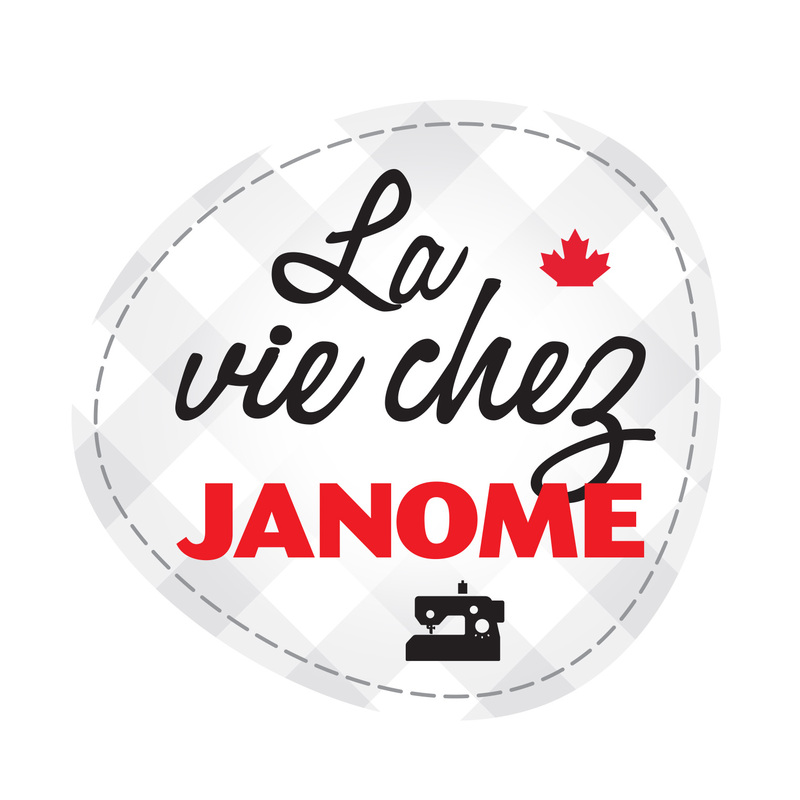 This entry was posted in GARMENT SEWING WITH JANOME, Janome Sewing Machine. Bookmark the permalink. Thanks so much! Great tips!! I have never sewn with slinky but am tempted to give it a try after reading this. 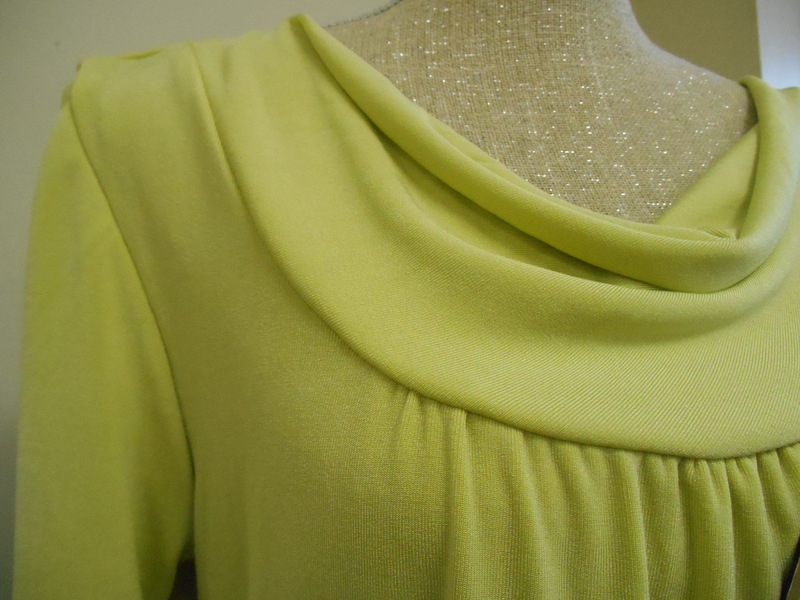 Love the draped-neck top you made – can you tell me the pattern name or number? Would love to have one or two of these tops in my closet!! Glad you liked the tips. Give slinky a try – it is a fun fabric. The pattern I used for the top is Simplicity 3790. It is an older pattern so Im not sure if it is still available in the catalogues. But there are many similar drape neck patterns available so Im sure you will find something suitable. I tend to stick with this one as I have made it so often so I know exactly what size I need and success is ensured. Hi Liz, did you think of adding an embroidery to break up the hit of colour? You will have to stabilize it very well, but the right design could look great. Did not think of that actually so thanks for the suggestion. I would be inclined to do tone on tone though otherwise I end up being limited to colours I can wear with the top & skirt.